To Bergen for a meeting of the Ludvig Holberg Memorial Prize committee, under the aimiable and efficient chairmanship of the Danish legal scholar Henning Koch. 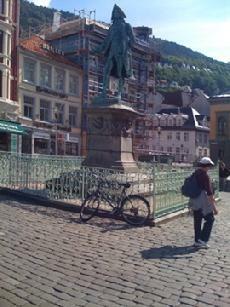 ( This is a picture of the statue of Holberg near the port.) We picked this year’s finalist whose name is …. confidential for the moment. (Check the website later on in the summer for the announcement.) 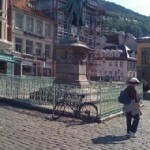 Everyone always warns you that it rains all the time in Bergen, but I had five days of beautiful sunny weather!